We have received several emails asking how to make signed words plural or showing if something happened in the past, as well as having emphasis to show desire. One way to show an emphasis or plurals is to repeat the sign. For example, if you are wanting to say “He wants that really bad!” You would sign WANT+WANT+THAT+HE. That double use of the sign want shows that he really wants it. You would NOT sign the word bad because it has a different meaning in this sentence. The double signing of want also makes it a plural. Showing something happened in the past can be done by making a gesture of throwing it over your shoulder. This is using the sign space that refers to the past. (Use the 5-hand with the palm facing backward, moving in a backward direction). You can also sign FINISH after a sign to show that it happened in the past. For example, if you want to say "He wanted to go." You could sign GO+HE+WANT+FINISH. There is an English signing method that has you add the S or ED or ING ending to the words but this is not as widely used and is actually frowned upon by most people who use American Sign Language. The more appropriate method is to determine what is meant and translate it accordingly. For example, if you want to say "He is left wanting." You could sign HE+WANT+MORE+STILL. Just wanted to say thanks for this discussion of signing technigue. I sign "Pidgin" Signed English and I appreciate you're including number 4 that helps me and my students. Could you do a blog on directional signs? Sure Amy....I'll add that to my list of topics...thanks! Hi I don't want to split hairs, but the word "wants" as used in your example sentence is not a plural noun. I agree signing "want want" is a good way to show the emphasis of desire for a certain item, but you are not describing a plurality. Thanks for your comment. That example was of to show emphasis, not plurality. Please don't split my hairs.....it's getting thin enough as it is! Hi John, this has nothing to do with showing how to make signs plural, but I just wanted you to please explain to me why sign language is backwards? Im teaching myself sign(have been for years) but, Im one of those people that must know why... I still dont understand why after all the webclasses and books I've read. To fully understand asl I cant just sign because Im suppose to sign it this way. Please I cant take this automatic pilot. Please help me, my daughter is 9 and deaf...I must know. Thank you very much. Perhaps Tiffani is commenting on the grammar word order in ASL. 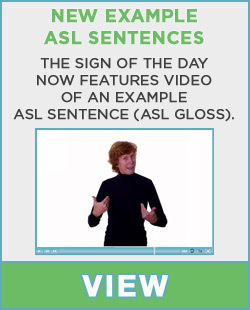 ASL doesn't not use English word order as it is, in fact, its own unique whole language. ASL is not simply a reflection of English and as such has its own grammar rules. You can compare it to English vs. French - each has its own rules of speech. There are other sign systems that try to approximate English. Each with varying degrees of acceptance. Signed English is one. If this is the case, perhaps it would be better to base your selection of a signing system on the one your daughter is using the majority of the time. I have a question regarding ing verbs. e.g. when signing- I AM LEARNING SIGN- you would sign- I LEARN + LEARN SIGN. Are all ing verbs signed this way? Is there anyway to down load the signing videos? I would like to be able to practice without have to set on the internet as well as I sometimes connect my computer to my TV for a larger clearer picture. Sorry if I confused anyone and yes I was referring to the word order in ASL. I just do not get the word order is there a website or can someone explain it to me better...please!! !Thank you for responding I really appreciate it. Also, I would suggest checking out your local Community College for ASL classes, if that is an option. First, let me say that my signing background is 'pidgon' Signed English that I learned in an academic environment. Next the ASL knowledge I have is from classes and not from living it. First, the time is established. Time in the sense that the conversation is about something that happened in the past, the present or the future. This eliminates the problem of conjugating verbs. For example, there would be no "danced", "dance" or "will dance". Once the time context is established the verb is always just 'dance'. True "Signed English" or "Seeing Exact English" would have you add endings to the verb to show past or future. Next, would be an introduction of the players in the sentence. In the sentence "Jimmy walked the dog." Jimmy and the dog would be signed. The order of the introduction would be the order of their appearance in the sentence. So Jimmy would be signed first and then the dog. Next, in this simple sentence, would be the verb - walk. This would be the complete sign string for Jimmy walked the dog. Past Jimmy dog walk. Let me know if I've gotten this wrong but that's how I think it goes. If you're looking for good reference on word order, the book "American Sign Language the Easy Way" is a good book. The first quarter of the book describes the grammar involved in sign language. However, Amy had some pretty good tips! So basically using ASL wording. The words like, is, it, the, a, are not used, usually. You skip all the non-essential words? Exactly, Kathi. There is no ASL sign for "is/am/are." You just act like it's not there, so "I'm tired" is simply signed I TIRED. "A/An" isn't necessary if you're signing something like "A man shot me" but if you're using it to indicate 1 of something or to be emphatic, you would sign 1. If "the" is being used as in "I'm going to the store," it's not needed, but if it's emphatic then you might want to use the sign "that." Time, Place, Person, Object, Verb. One of the first exercises that she had us complete was to rewrite English structured sentences in ASL word order. I found this to be very helpful as we've progressed further into the class, and have often referred back to this. How do I get my signs to flow together so that I don't look choppy when I am signing? As a beginning signer, it is just natural that you will be choppy. Once you get a larger sign vocabulary, you will not be so worried about searching for a way to say something that you know the signs for and you will be able to focus on the flow of your signs. When you sign music it also helps with the flow if you let the music guide you. There are a few different sites on the internet for you to watch music being signed to show you what I mean. For example, check out the D-Pan. Remember as I have stated in previous blogs, when you are signing music it is glossed (changed into concepts rather than word for word). Check out some songs that are popular and see if you can catch what the people are signing and why they are signing them that way. It is actually an art form all it's own. My friends and I LOVE to sign to songs durig choir! Another thing that I've figured out is that when you're signing a song in stage, you have to over exagerate the signs so the people in the audience can see them. Thanks for the link to D-PAN, had never heard of that and they have some great stuff over there. I showed them to the 7 year old, HOH girl I work with and she was so amazed that there are lots of other people using sign language like this. We are in a situation, that I bet some others making use of this great site are in, where she is like the very only person who uses sign language in her day to day life (besides myself, and I only work with her in school). Just googling "ASL song" will get a huge amt. of different songs on YouTube done by both Deaf-HOH folks as well as others that are just trying to learn/use this great language. It can be quite a revelation to see that there is a whole world of people out there that love and use sign language when members of your own family just will not or cannot learn practically any. I've considered it a very good use of our time the few sessions of just trolling the internet looking for ways others use sign language. I've been astounded how isolated people can be who rely on sign language if they are primarily "mainstreamed." This site and others can at least HELP with that by showing you are not alone.